"The gorgeous Limited Edition Bath and Body ranges from The Body Shop are bursting with irresistible aromas to get you into the festive mood this winter. Whether it is the exciting new Limited Edition Ginger Sparkle, the festive Limited Edition Cranberry Joy or the invigorating Limited Edition Vanilla Bliss range, there is an indulgent fragrance to suit every need." The best thing about buying holiday gifts from The Body Shop is that TBS products contain ingredients sourced through Community Fair Trade Programme, which benefits communities in need across the world. 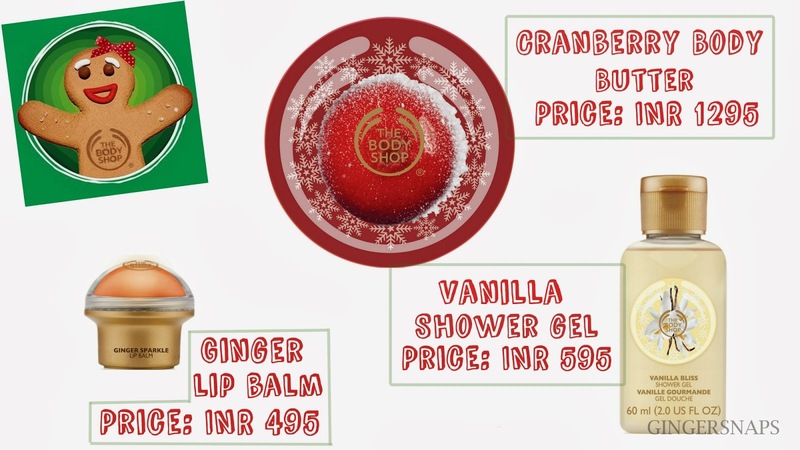 So I think The Body Shop limited edition range of products in Cranberry Joy, Ginger Sparkle and Vanilla Bliss, makes for some great holiday gifts. Personally, I have always found the TBS holiday edition Ginger Sparkle Range delightful (hope my friends are taking notes.) What do you say ladies, do you see something that you would like add to your Christmas wish list? I have tried their body polish. Not bad! I want to buy these things! Great ideas!! I love THE BODY SHOP! Ohh these all sound terrific, they must be wonderfully scented! Thanks for your kinds words dear, have a warm and splendid weekend! I want everything, especially the cramberry body butter. Great choices! I didn't know that fact about Body Shop. The last I knew was many years ago, they closed for months or maybe a year due to some animal testing issue. TBS has always prided itself for being against animal testing so the closure and eventual speculation was a huge matter. I stopped visitig TBS coz I realised I prefer flowery scent from Crabtree and L'Occitane a lot more. TBS usually has fruity scent. Thanx for sharing this new info. Thank you so much for visiting my blog and following. I appreciate that. LOL at your comment about the permanent filter like in Instagram. That's totally witty! Following you tru GFC too, dear. Let me know if you wanna follow on Instagram or something. Happy Sunday! I so wanna try the ginger lip balm. Your blog is amazing. Addicted to it. Great ideas hun. Have a wonderful day.